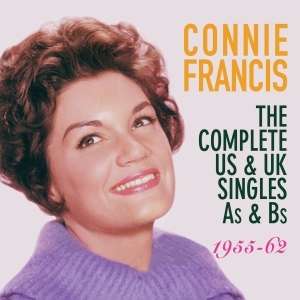 Connie Francis was one of the iconic stars of the rock ‘n’ roll era, a wonderfully distinctive and versatile singer who could handle the gamut of repertoire from schmaltzy revivals of vaudeville classics through to the bounciest pop material that the Brill Building writers could supply her. We nearly didn’t get to enjoy this fabulous collection of work, since her breakthrough hit “Who’s Sorry Now” was a last-chance end-of session afterthought when MGM were about to drop her after a series of misses. It struck gold, and was followed by a string of classics that made Connie one of the most popular performers of the time. Not every record she made was a hit, of course, quite apart from rarely-heard B sides, so this complete collection of both sides of all her single releases through the primary years of her chart career, including the ten releases before her debut hit, is a chance to enjoy the full spectrum of her unique talent.It includes not only both sides of all her original US singles but also the fifteen tracks which were released as A or B sides in the UK for a variety of commercial and creative reasons, making it a thorough overview of her chart career through to the year she bade farewell to the Top 10 on both sides of the Atlantic.